Rio thinks he’s done nothing wrong. Oliver Holt, Chief Football Writer for the Daily Mirror, thinks he’s done nothing wrong. But how wrong they both are. As someone who is an aspiring sports journalist, you pick up the unwritten rules relatively quickly – and one of the most important is ‘print nothing that’s off record’. So when a direct message from Rio Ferdinand on Twitter appears in your inbox, labelling you a ‘fat prick‘, you have to laugh it off, and be the bigger person. But Holt retweeted it. And the footballing and journalistic world went into raptures. Now I must state now, I don’t condone Holt’s actions, as a private direct message should stay exactly that, no matter what it says. It is between two people who happen to be famous in their field. But I can see why Holt chose to send that out. He has just under 36,000 followers on Twitter, of which the vast majority will also be following Rio. To show Rio as someone who can be quite intimidating and vulgar at times was his ultimate goal – and he has done that now. But like the Ryan Giggs scandal (which I hear is about to take another twist in tomorrow morning’s papers…), this opens a whole can of worms. Will footballers now stop speaking to journalists candidly, so as not to risk anything negative being printed? Will they now stop using social media as a way to interact with fans? 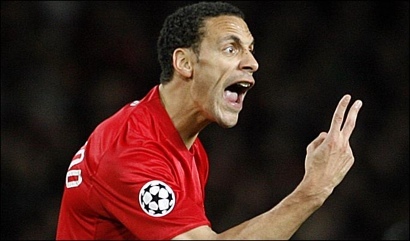 Will Rio suffer another pointless FA ban? Bearing in mind their stance on Twitter, and the precedent of Wayne Rooney regarding bans from foul language, it wouldn’t surprise me. Should journalists now choose to stick to writing articles, as opposed to stating opinion through the likes of Twitter? Will there now have to be some form of code of conduct to stop this happening again? And will Holt actually have tarnished his reputation, not just with United fans, but within the journalistic circle too? These are all just hypothetical questions, and I’m sure this whole situation will have blown over by tomorrow and Rio will have ‘stayed on his feet’ and made up with Ollie Holt. But it does make you wonder whether this will be the beginning of the end of the Twitter revolution we’ve begun to love. 18 months ago, no-one would have dreamed of being able to speak to major sports stars about bananas, and Gary Lineker, and Hollyoaks. Twitter made that a reality, and Rio was the frontrunner for it all. But if Rio goes, and the FA Twitter fines continue, will many more stay? Time will tell, but these will be uncertain times for social media, sports stars and journalists.